British Milk. Double layer of compote. Thick 'n' creamy. Natural ingredients. Gluten free. Vegetarian friendly. Ah the passion! 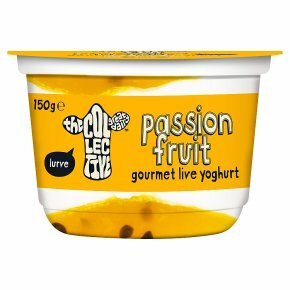 layers of heaven sent nectar when combined with our ridiculously tasty thick 'n' creamy yoghurt transform a good thing into a real beauty that'll deliver a kiss straight from the tropics, no bull! Our li'l tubs have had a makeover! At The Collective, we're committed to ensuring our business is at the forefront of sustainability for the future. We've decided to remove the spoon and lid from our li'l pots, saving over 35 tonnes of plastic per year! That's the same as over 80 grand pianos!